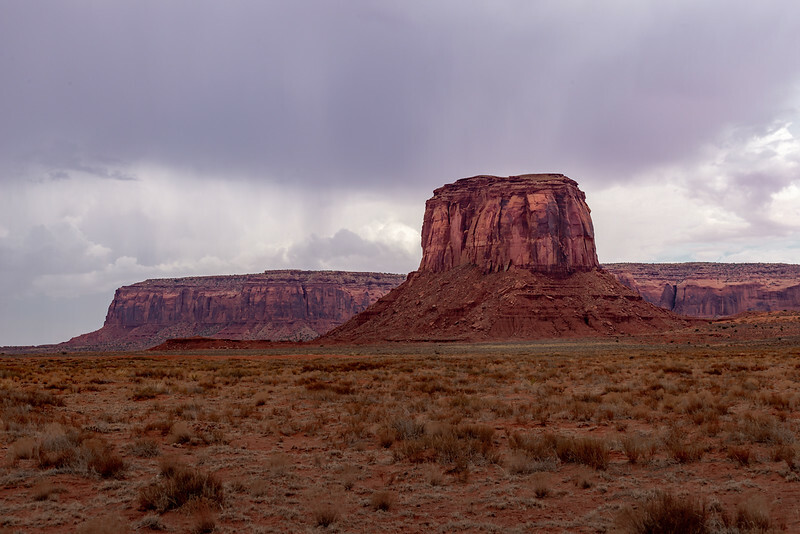 There are many things to see and do in the American Southwest. 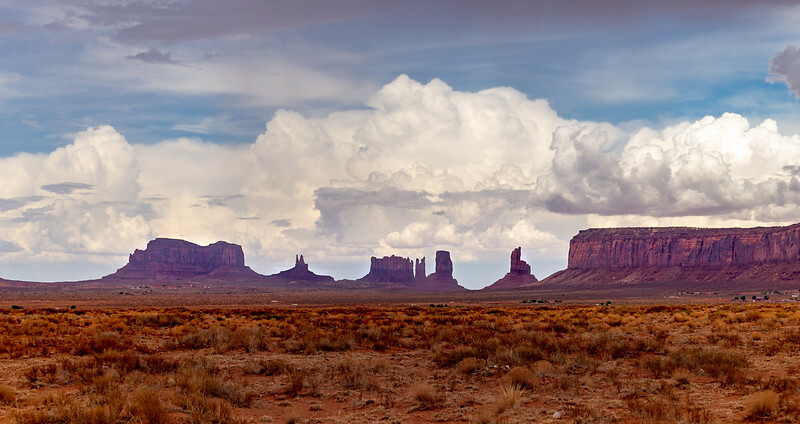 From a variety of national parks like the Grand Canyon and Monument Valley to charming little towns, this area of the the country is really exceptional. 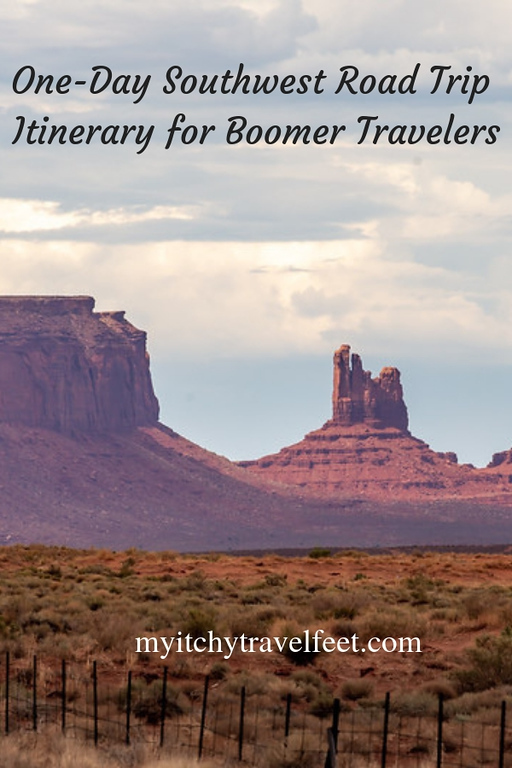 Today’s guest contributor, Shelli Elledge from Written FYI, recently took a boomer road trip through the Southwest, from Arizona to New Mexico. Buckle up as she takes us along on her one-day southwestern road trip adventure! Love the freedom and flexibility of a road trip? My husband and I do, too! Fall is one of the best times for active boomers to take a scenic driving adventure in the Great Southwest, especially in Arizona and New Mexico. 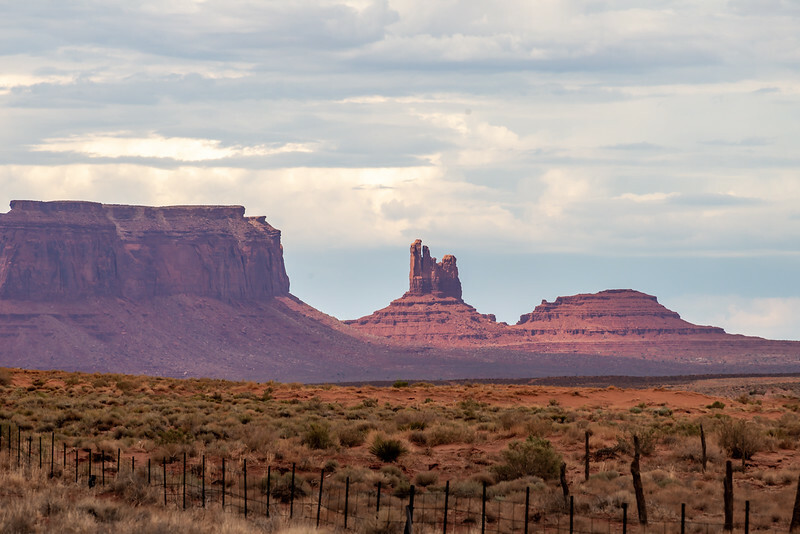 The weather is cooler, there’s less traffic than during the summer months, and the far-reaching stretches of US Interstate 40 offer unforgettable views, interesting towns, and fabled landscapes. We start our one-day road southwest road trip itinerary in Flagstaff, a small bustling small city in northern Arizona that seems much bigger than it is. Combining the vitality of a college town and the tranquility of surrounding forests, meadows, and mountains, it appeals to almost everyone. 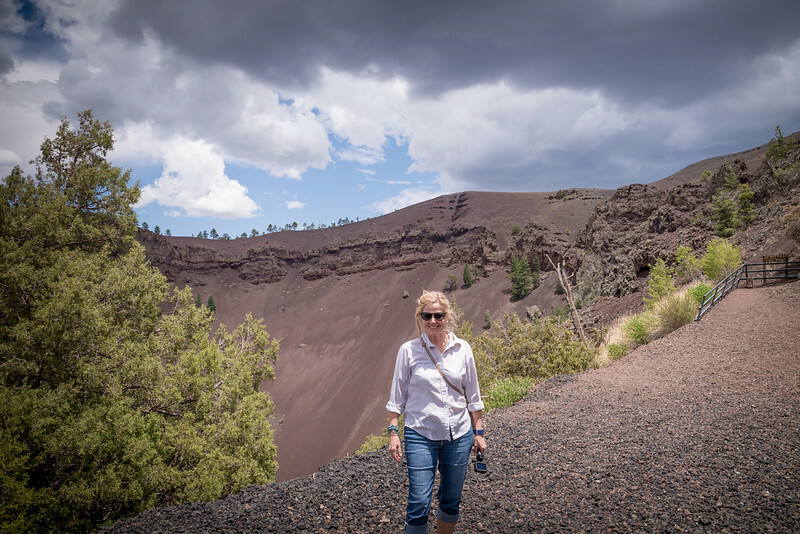 Flagstaff is also an important gateway to the super-amazing geological wonders of the Grand Canyon National Park and the Monument Valley, both of which are side trips worthy in themselves! However, for this trip across the desert, our plan is to make several stops along the way to do some boomer sightseeing, take a short detour off the freeway to get in some hiking, and then be in Albuquerque, New Mexico in time for dinner! As we head east from Flagstaff on I-40, mountains in our rear-view mirror, we’re surrounded by the arid desert. Not completely desolate, though, because the interstate passes through several former movie star towns that haven’t changed much since their glory days. The red rock formation at the border crossing between Arizona and New Mexico on I-40. One such place is the small rustic town of Winslow. You might decide not to stop, since it’s only 60 miles from your starting point in Flagstaff. But if you want to get a feel for the former glory days of the railroad and Route 66 eras, this town offers a couple of sites that are boomer-worthy of exploring. 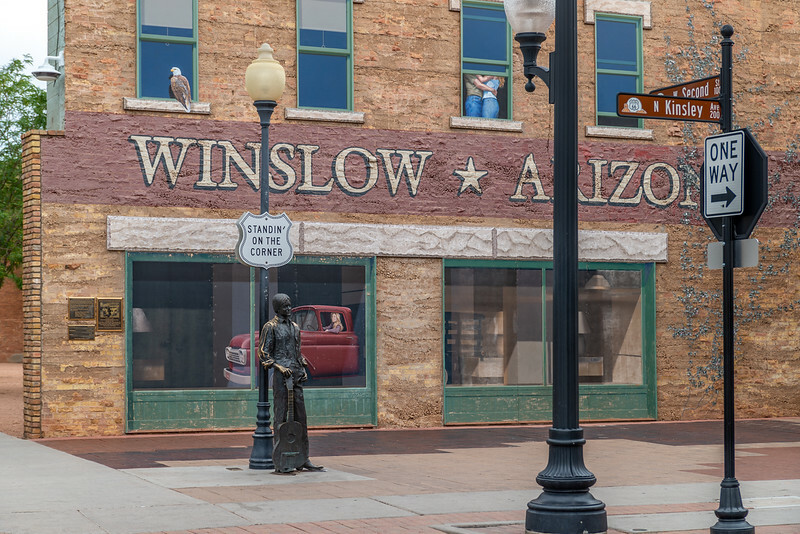 Standin’ on the corner in Winslow, Arizona. First, there’s the beautifully restored La Posada Hotel. Once the prestigious showplace of a wealthy railroad hotelier during the 1920s, it lives on as an oasis in the desert for Amtrak train travelers and road trippers, alike. Multiple vegetable, herb, and rose gardens, lobbies, galleries, and the still-illustrious Turquoise Room are interesting places to imagine the lifestyles of the rich and famous from a bygone era of the expansion years. 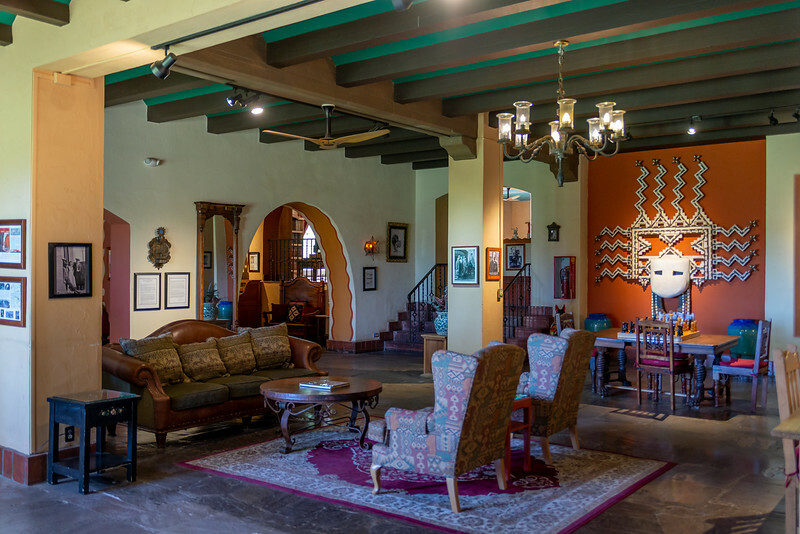 The La Posada Hotel is an historic hotel located in Winslow, Arizona. Back on the road, you might find it difficult to decide on your next stop. You could traipse the badlands of the Painted Desert. Or, you might want to discover your own areas of the Petrified Forest National Park. Both are fascinating sites well worth your time and within easy access from the freeway! You’ll know you’ve reached the New Mexico border by the huge rock formation just off the freeway that seems to announce you’re entering protected tribal lands. You’ll also notice that landscapes are no longer flat and treeless, but hilly with a scrubby covering of oak, juniper, and pine. Breezing through the open countryside, you’ll see occasional patches of the old Route 66 and pass by Native American farms and pueblos. In the background, pottery-colored mesas, desert-colored in lavender, sand, rust, and coral, contrast with the clear azure blue New Mexican sky. It’s scenes like these that make for interesting focal points for boomer history buffs and photographers! When you reach Gallup, you’re already more than half-way to your destination in Albuquerque. That means you have plenty of time to escape the freeway and see why this town is such an important Native American center. 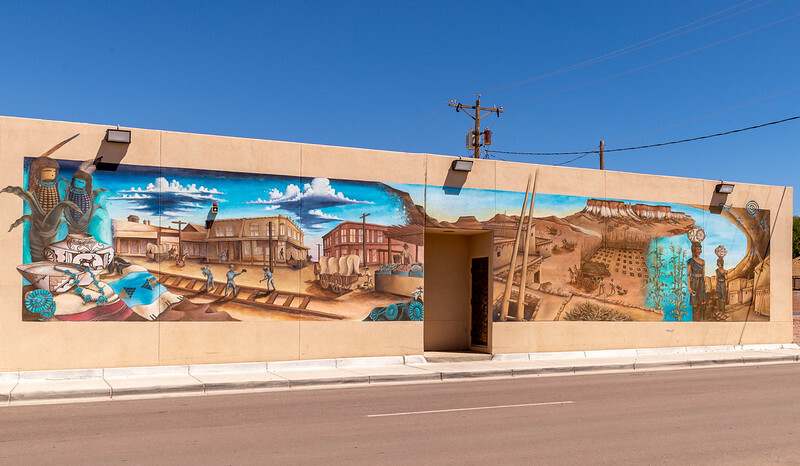 Gallup Mural dedicated to the Zuni Native Americans. 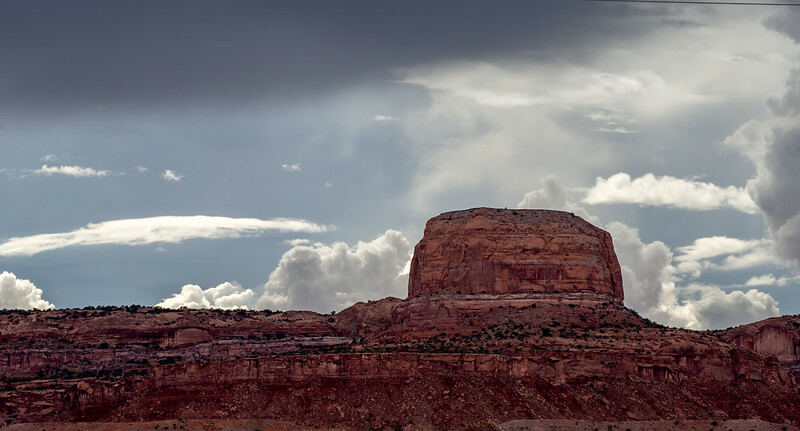 Gallup is one of those must-see, culture-rich market places as fascinating any you’ll ever find in the American Southwest. 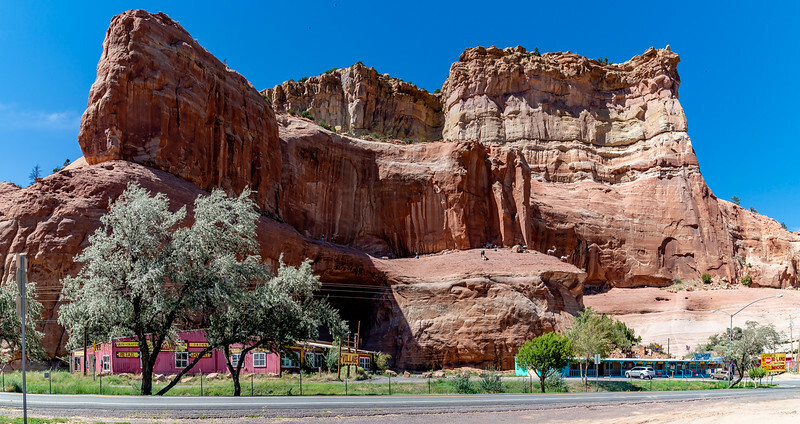 Once an important trading post, it continues to be the thriving heart and soul of the Navajo, Hopi, and Zuni Native American communities. It could take up a whole day just exploring the beautiful murals. The main street in town runs parallel to the railroad tracks and is lined with shops selling handmade products. Vibrant woven rugs, extraordinary silver and turquoise jewelry, hand-tooled leather products, art, and pottery make it a shopper’s delight! If you’re hungry for southwestern foods (think pinto beans, roasted corn, chili enchiladas, and fry bread), there’s nothing like refueling in a town like Gallup. The real dilemma comes when deciding which restaurant to choose. One of our favorites is the historic Hotel El Rancho, picture-worthy and listed on the National Register of Historic Places. 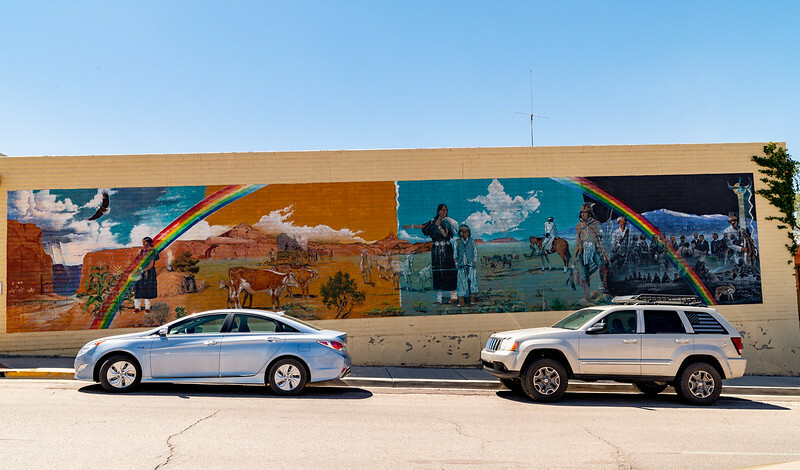 After a filling lunch, you might want to wander the downtown area to view the inspiring murals, pop into one of the many museums, or tour the notable McKinley County Court House. After leaving Gallup and driving about hour down the road, you’ll arrive in Grants. If you’re anything like us, you’ll probably be getting anxious to get out of the car and get some physical activity — like hiking! The Land of Fire and Ice is made up of Bandera Volcano and Ice Cave. That’s why you might like to take a detour from Interstate 40 and head south on State Highway 53. Just twenty-eight miles from the freeway is an obscure little geological area called the Land of Fire and Ice. The “Fire” in the name refers to the area’s inactive volcano and the “Ice” is a clam-shaped spring used by early settlers in the region. This is a fascinating place to stop and explore. Debbie and Tracy will greet you in the original cabin-turned-office that was once the landowner’s rustic home. 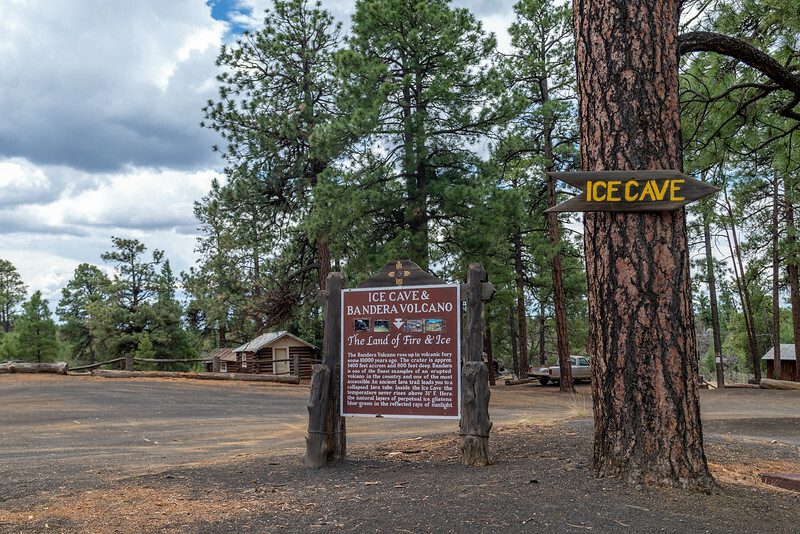 The ladies will provide you with a hiking map, which you won’t need because the trail is less than a half-mile long in each direction, and they’ll explain some history about the place. As for the hike, it’s a bit of an incline getting to the top, but the trail is a wide graveled path and the views are terrific. There are benches along the side so if you have time, savor the sights and smells of the fresh forest. Then, bid the ladies farewell, jump in the car, and head back towards the interstate. Without feeling like you’ve lost too much time, you’ll feel revived and your FitBit will love you! You’ll want to read Donna’s ebook, New Mexico Backroads Weekend Adventure to make the most of your time in Grants. The distance from Grants to Albuquerque takes a little more than an hour, so the afternoon sun will be setting in your rear-view mirror. This is the best time of day to arrive in Albuquerque because the lights of the city are just beginning to twinkle and the soft lighting makes the Sandia Mountain appear pink. 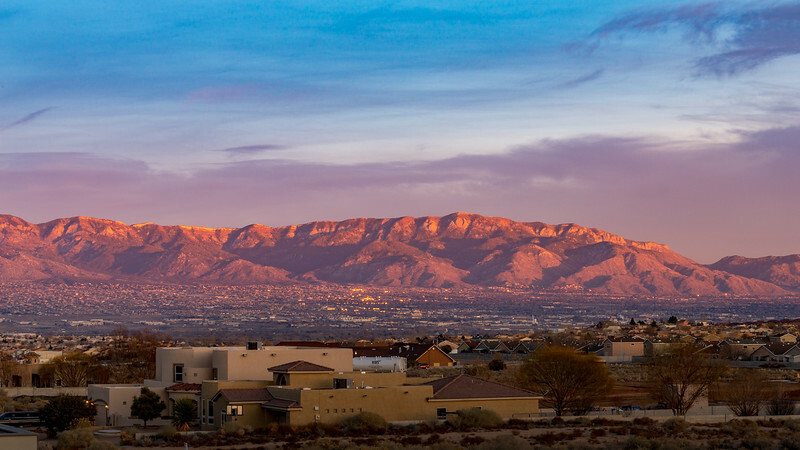 The Sandia Mountains on the east side of Albuquerque, New Mexico are beautiful in every setting,but especially when the sun is setting. Albuquerque, the largest city in New Mexico, is a place where traditions run deep. Although there’s a massive revitalization going on in the downtown area, its southwestern design continues strong. After a day of driving you might want to stay at the beautifully restored Hotel Andaluz which also has an amazing dining room and tapa selection. If you prefer authentic regional dishes, we continually fall back on the Range Cafe. And for tasting some of the nation’s best sparkling wine, be sure to stop at the Gruet Winery tasting room. From Flagstaff to Albuquerque is a little more than 300 miles and we’ve seen a handful of sights that are uniquely characteristic of the Southwestern region of the US. Next time, you might want to stay awhile because the sightseeing, hiking, and exploring options are almost endless! Shelli is an elementary school teacher and travel writer based in New Mexico. In her free time, she enjoys exploring, trying out a new vegan recipe, or working on her yoga. She loves to incorporate real life experiences and historical significance into her articles and blog posts.